The longest continent to continent sailing race in the Southern Hemisphere – the Cape to Rio set off in two starts: the first one on 26 December 2016 and the second (for the faster yachts) on 1 January 2017. The second start were chasing the record set in 2014 when Giovani Soldini’s Volvo 70, Maserati shattered the course record, which had stood for 14 years by completing the 3 300 mile course in 10 days, 11 hours, 29 minutes and 57 seconds. Maserati beat the previous record by over two days. Runaway crossed the finish line at 03:04:15 UTC on the 14th of January 2017 completing the course in 13 days 13 hours 4 minutes and 15 seconds after leaving Cape Town for Rio de Janeiro on Sunday 1 January at 14h00. The Andrews 70 foot design owned and skippered by Hector Velarde from Lima, Peru sailed to Rio de Janeiro with Navigator Chris Busch and Crew: Thomas Corkett, Steven Dodd, Chadwick Hough, Keith Kilpatrick, Tyler Prentice, Randy Moreno, Erik Kristinsen and Hogan Beatie. Runaway was built in 1995 and sails out of the Waikiki Yacht Club. 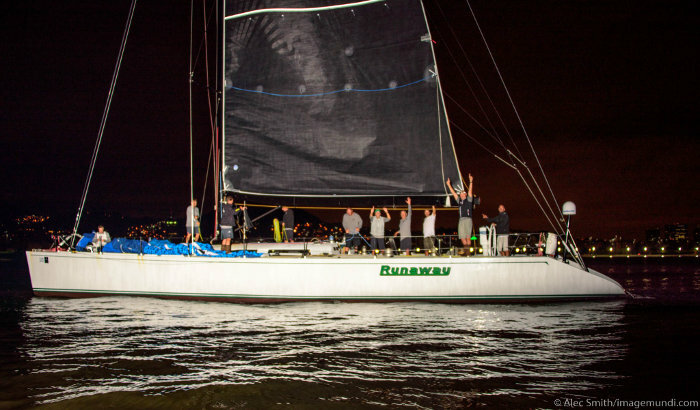 Velarde’s Runaway was the 15th yacht to enter the 2017 Cape to Rio and is best suited to what is normally a sleigh ride of a race – spinnaker up and race along the rhumb line to the finish. Runaway has competed in other ‘sleigh ride races’ such as the Transpac – sailed from San Pedro, Los Angeles and ending off Diamond Head Lighthouse in Honolulu, a distance of around 2 225 nautical miles – and the Vallarta Race – a 1000 nautical mile course from San Diego, USA to Puerto Vallarta, Mexico. In the 2016 Vallarta Runaway finished second to Roy Disney’s sled (also an Andrews 70 design). The Transpacific, like the Cape to Rio, is a race is famous for fast downwind sailing under spinnaker in the trade winds and Roy Disney’s Andrews 70 was the first over the line in 1997, 1999 and 2007. Velarde is a seasoned campaigner on the international yacht racing circuit with many Antigua Weeks under his belt in another luxury yacht, Locura. Locura cruised the Pacific, Tahiti and Mexico before the 2012 Antigua Sailing Week which was Locura’s debut into racing in a regatta and she took a 2nd place in her division going on to race in two Transpac Races from California to Hawaii. The 92 foot Peruvian registered Locura also sailed in the Pacific Cup with Velarde a veteran of three Pacific Cups having sailed his Nelson/Marek 92 Locura in the 2014 Pac Cup, and his Santa Cruz 70, Mirage, in the 2010 race, finishing fourth overall and then second in 2016. On course to finish second with 315 nautical miles to Rio de Janeiro is Black Pearl – a Carkeek 47 owned and skippered by Stefan Jentzsch from the Royal Ocean Racing Club in Germany. Barring any major disasters the first South African yacht to finish will be Lion of Africa Vulcan – a GP 42 owned and skippered by Hylton Hale and representing the Royal Cape Yacht Club, Cape Town with 638 nautical miles to go. Port Elizabeth sailors are represented on two yachts in the Cape to Rio – the Bailes family on Ray of Light and Michael Giles on Skimmer. Ray of Light has 1212 nautical miles to go and on 13 January 2017 was lying in sixth place in her division. Skimmer has 885 nautical miles to go and is the only yacht in her division after the retirement of WOW – a Stealth 14GT catamaran owned and skippered by David Liddell. Previous: And you thought Sailing was a clean sport?